Cream of Peanut Soup, a mainstay at Colonial Williamsburg’s King’s Arms Tavern, is oddly scrumptious. We’ve updated the historical recipe with 21st Century tastes in mind, while retaining the rich, satisfying essence of original. The first time I ever tasted peanut soup was at the Kings Arms Tavern in Colonial Williamsburg, Virginia. I was seventeen, traveling with my high school history class on our much-anticipated “East Coast American History Tour.” We had been studying, planning, and saving our pennies for three long years to travel from Oregon to the East Coast, and Williamsburg was one of our most anticipated stops. Colonial Williamsburg, as you may know, is a full-scale working village that recreates the town of Williamsburg during the time period leading up to the American Revolution. The King’s Arms Tavern first opened there in 1772. 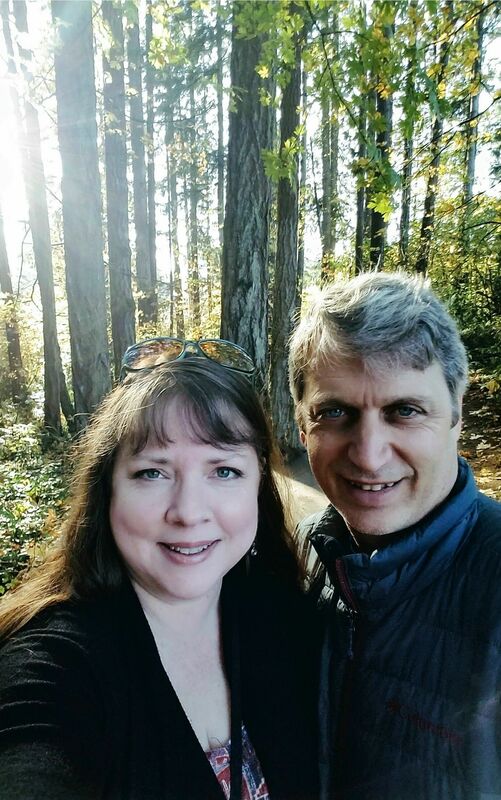 That me on the left with my lifelong friend Julie B, waiting in the Portland airport to take off on our East Coast adventure. From an era long before selfies, it is one of only two pictures I have of myself from the entire trip. 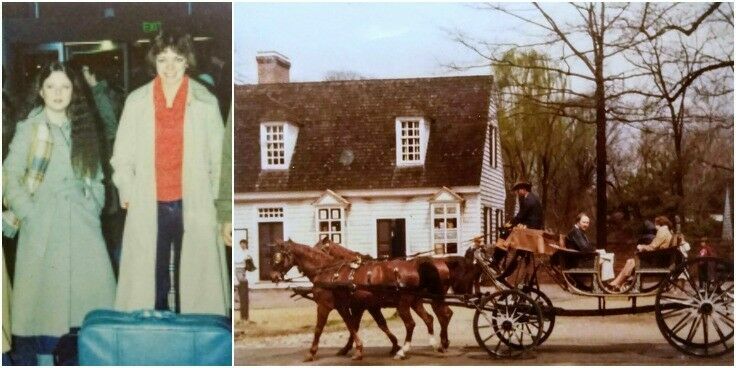 The image on the right is a shot of Colonial Williamsburg. As my classmates and I settled in for dinner, I vaguely remember an older lady in Colonial costuming reviewing our prix fixe menu with us, adding colorful little stories and historical context about each dish as she went. Reading ahead, I noted that one of our courses was to be “peanut soup.” I’d never heard of such a thing and was intrigued. Peanut soup? It sounded oddly scrumptious. Peanuts, the Colonial lady continued, were thought to have been brought to America by Portuguese slave traders. Along with black-eyed peas and yams, peanuts were carried on slave ships to feed enslaved Africans during their passage to the New World. 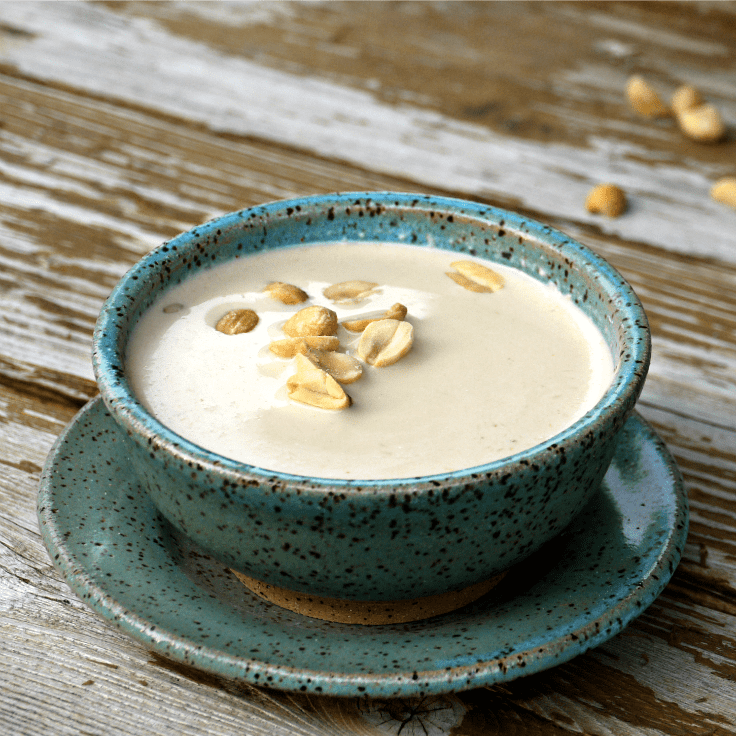 Peanut soup itself is most certainly an adaptation of the peanut soups brought from Africa. Soon after our hostess completed her introduction of the menu, our peanut soup arrived, accompanied by a sweet potato roll. The soup was creamy and smooth as silk, and the sweet potato rolls were warm and crusty. The two created a perfect pairing, and were very satisfying all by themselves. I was full before the end of the soup course, and though I don’t remember the rest of the meal, I do remember buying a cookbook for my mom before we left the King’s Arms Tavern. That trip was eons ago, and the cookbook is now mine. So it was to the Williamsburg Cookbook that I first referred when I set out to recreate the memory of that long-ago peanut soup. However, after making a test batch per the directions, I was a little disappointed in the outcome: it was simply too bland for my 21st century tastes, so I decided to make some adjustments. The first thing I did was cut the recipe in half, for two reasons: first, the original recipe makes almost four quarts of peanut soup! Unless you have a very large family or are running a Colonial tavern, you do not need four quarts of peanut soup. Which leads me to the second reason I decreased the recipe: this is a Very Rich Cream Soup. You simply won’t need as much peanut soup as you might need, say a lighter, brothier soup like chicken noodle or beef barley. Peanut soup is very much like a thin satay sauce, but less sweet. To the original list of ingredients, I added lemon juice for brightness, hot pepper for kick, brown sugar (because it is the secret to almost everything), and kosher salt because – Holy-Low-Sodium-Diet, Batman! – did this recipe ever need it! Inspired by the Peanut Soup at the King's Arms Tavern in Colonial Williamsburg. Sprinkle flour over sautéed vegetables and stir to combine. Stir to saute for one minute. Add chicken or vegetable stock to vegetables. Bring mixture to boil, stirring constantly. Remove from heat. Allow the vegetable mixture to cool to a temperature that is safe to work with before proceeding to the next step. Option 1: Puree the cooled soup in the saucepan with a hand blender until smooth. Option 2: Puree the cooled soup in a blender and return to saucepan. Into the pureed soup in pan, add the peanut butter and half & half. Stir until peanut butter has completely dissolved into the soup. Stir in lemon juice, kosher salt, hot pepper sauce, and brown sugar. Return pan to heat only to warm to soup to serving temperature. (DO NOT BOIL!) Garnish as desired. Peanut soup can be served hot or cold. (Mr B and I both prefer it warm.) Pair it with a green salad and you’ve got yourself a seriously satisfying meal. 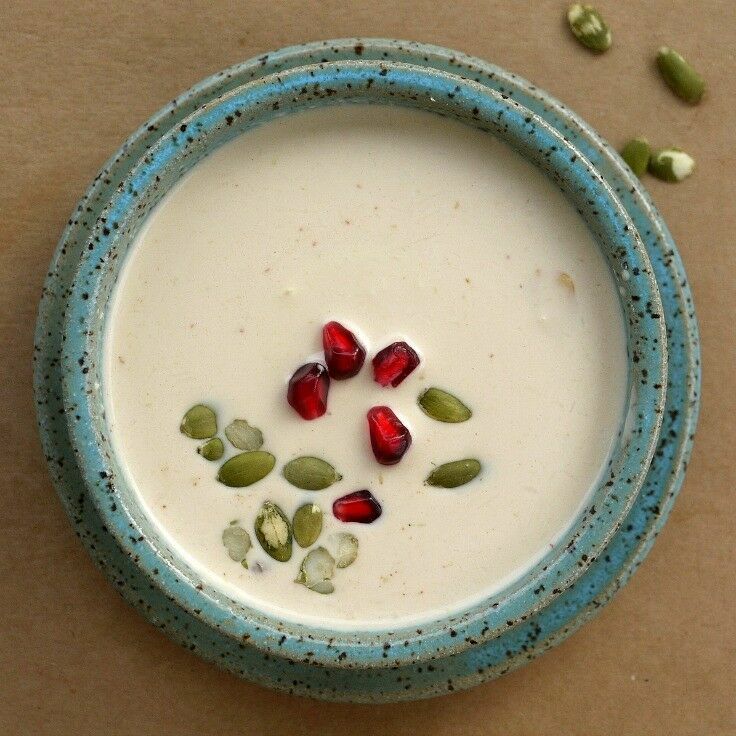 Many people reserve peanut soup for the holidays, like stuffing or cranberry sauce. 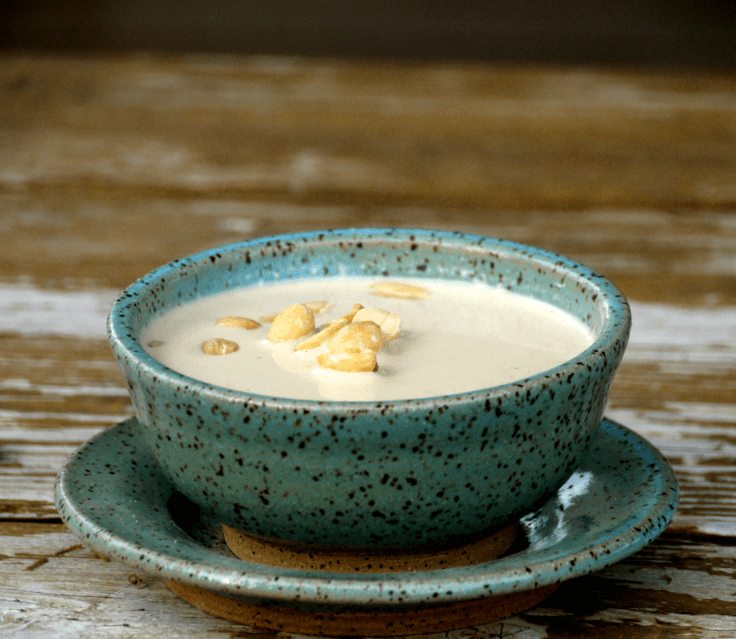 If it is your plan serve peanut soup as the first course of a larger meal, we suggest offering it in small bowls or demitasse cups, no more than 4-5 inches across. Serving small portions will make a satisfying transition to the main course without ruining your guests’ appetites. 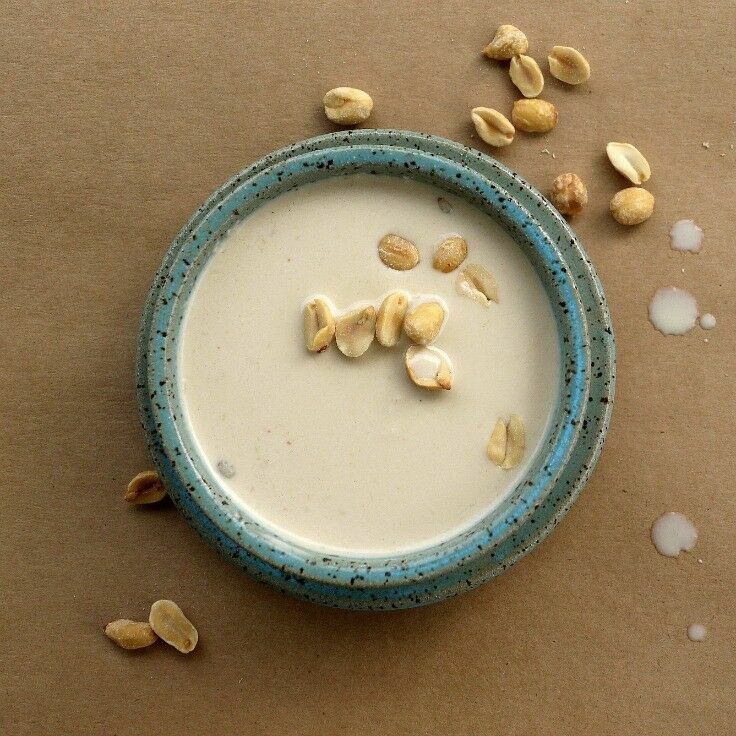 Peanut soup can be served as is, but if you want to make things interesting, offer toppings in small cups or bowls and give your guests the opportunity to create their own flavor combinations. My favorite combo so far is bacon, pine nuts, pomegranate pips, and a dash of harissa. NOTE: The word “topping” is actually a bit of a misnomer. While this is a very rich soup, it isn’t as thick as you might imagine, so heavier toppings tend to sink to the bottom of your bowl. (Don’t tell anyone, but I had to use a little blogger magic to keep those banana chips floating on the surface.) Anyway, that’s what spoons are for. This list of topping ideas is intended to get you started, but there are dozens of other choices that would work just as well. Just look through your pantry and/or fridge and pick out something fun! Choose topping/add-ins that give the soup crunch, and bite, and really enhance the flavor of the soup itself. Fresh, citrusy flavors and little crunchy bites work especially well. Thank you so much for being a faithful reader and supporter of The Good Hearted Woman. ❤ Be sure to Pin and Print this recipe! 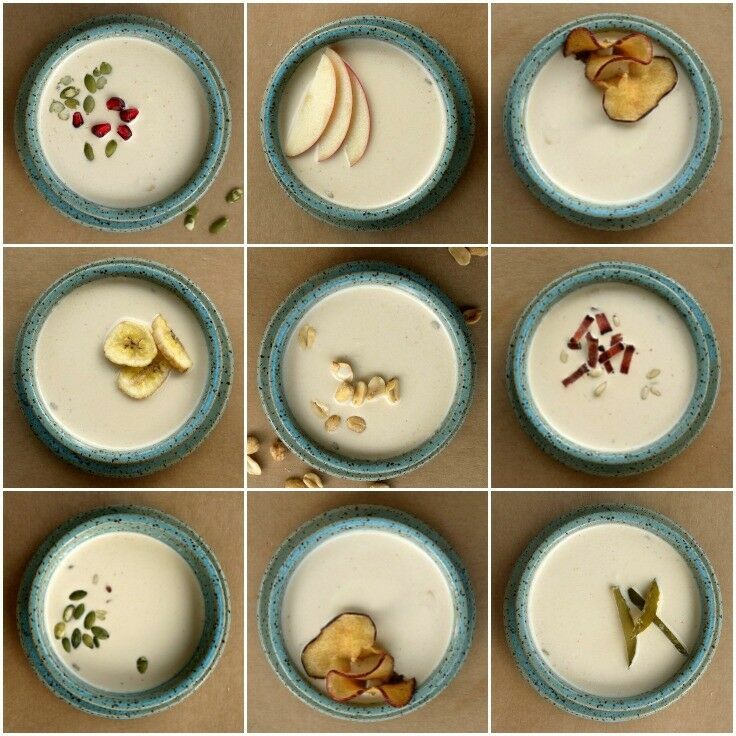 Mmmm… I love all of the various kinds of peanut soups out there. We make a Filipino peanut stew and I love African peanut soup, but this peanut soup looks so different from both, and sounds absolutely delicious. 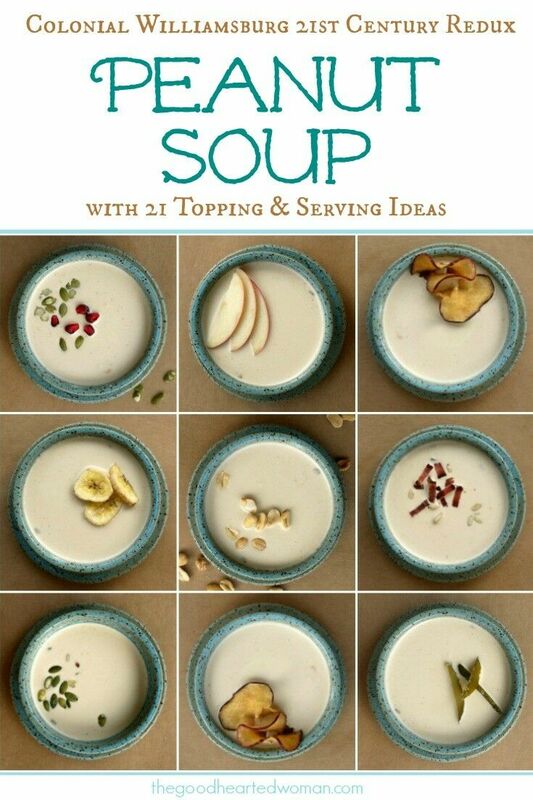 Love the creamy, smooth texture of this soup, and what creative toppings you’ve come up with for this! Looks delicious! Need to try soon! I grew up a stones throw from Colonial Williamsburg and have been to the Kings Arms numerous times… Love that peanut soup. You’ve brought back so many memories for me. Thank you. That is so cool, Lisa! We took our kids to visit Colonial Williamsburg a decade or so ago, and it was such a memorable trip. I’d love to visit again sometime. I bet this soup is so delicious as I enjoy peanuts I use them a lot in my traditional Mexican cooking. I like that you can pair it in so many ways this is a great canvas to complement a menu. Never been to Williamsburg now I need to visit. This sounds so interesting! Can’t wait to try this soup! This sounds amazing! I love peanut butter, so peanut butter soup sounds like a dream come true. I also enjoyed reading about the historical background of the soup! What an interesting recipe! This sounds so warm and comforting on a cold winter night! 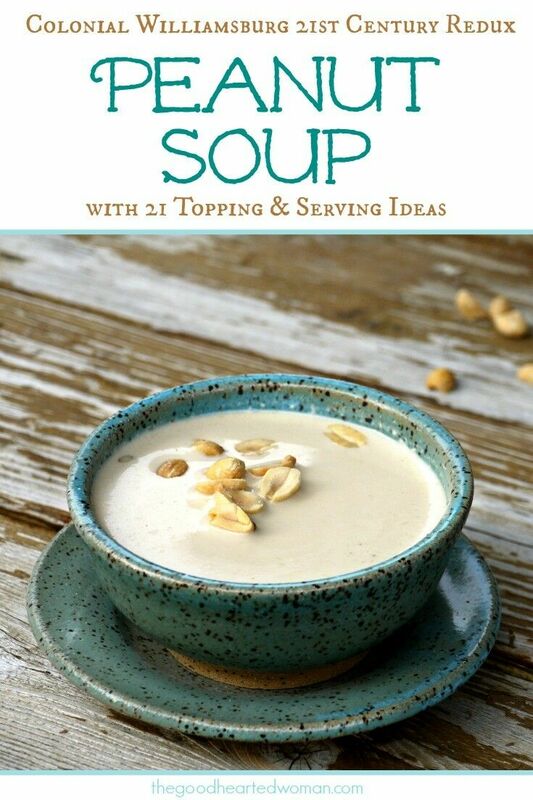 I haven’t heard of a peanut soup before, it sounds really interesting. I’ll have to give it a try. I have never had peanut soup! It sounds yummy, I will have to try this. I’ve never had peanut soup before, but it looks delicious! I love all the different ways you can customize it to your taste buds!